Behold – the FastModel Sports Top 20 Plays of 2017. 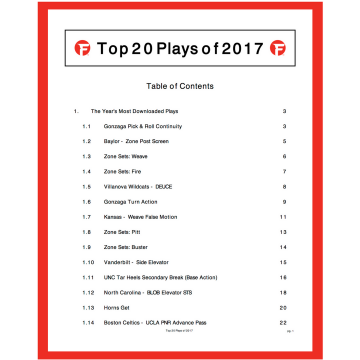 This playbook is compiled of the most downloaded FastDraw plays from our FastModel Sports PlayBank this year. This database is a phenomenal resource for thousands of coaches from every level of the game – youth, high school, college and even professional. Our PlayBank hosts over 8,000 plays that have been drawn and posted by the top coaches in the game. Our goal is to spread knowledge by sharing X’s and O’s with the coaching community in order to grow the profession. This playbook contains the best plays in the coaching industry. Each play has a short description along with the number of times it was downloaded from the PlayBank. We are proud to present you with the Top 20 Plays of 2017. Not enough for you? Then visit the PlayBank to search for more – find anything you need, from zone offense sets to late game plays to practice drills. 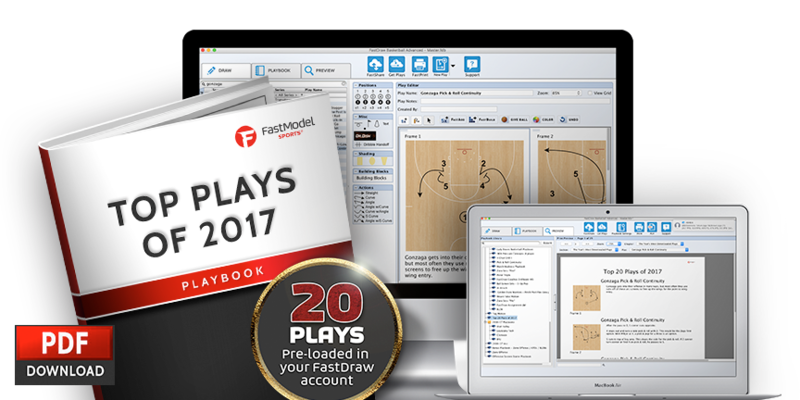 Download these plays directly into your FastDraw library with just couple clicks, or grab a PDF – or both! We hope you enjoy, and may this playbook bring you many wins! Basics of the Gonzaga Bulldogs Pick and Roll continuity offense. The Zags use it as a base offense and have several reads depending on how the defense plays certain actions. Great for side ball screens and also high-low looks. Baylor uses this zone quick hitter to get the ball inside to the post. x2 matches up with 2 on the first pass. 2 keeps this matchup while dribbling at 1. x1 has to match up with 1 on the pass to 1. x3 then has to guard 3 in the corner. 4 screens x5 in the middle of the zone to free up 5 at the basket. Weave is a favorite set to get a three-point shot against a zone. The dribble weave lulls the defense to sleep, setting up a double screen, which gets a guard an open shot on the throwback. Also option to hit 5 who seals middle defender of the zone. One of four common ball screens in Villanova’s 4-Out Offense is the Deuce. A Deuce is an inside high ball screen set in the slot. It is so named because of there are two perimeter players on the opposite side that the ball screen takes place. These players automatically exchange when they see a Deuce. Guard involved in the ball screen is looking to SCORE! This action is beneficial because it provides opportunities for both guards and posts to make plays. Gonzaga begins in a 4-Out alignment and runs a staggered double for 2, which then goes right into a ball screen with 2 and 4. There is a throwback and high-low look before 5 passes to 3 on the wing and sets a ball screen. 4 can “crack” x4 to get a post touch, or rise for a reversal pass. The weave acts as false motion to occupy the defense before getting into a spread ball screen alignment. The defense will have a tough time being in position to stop both the roll and the kick out – one should be open. Pitt is a zone set designed to get an interior catch. By running a shooter to the corner, it stretches the bottom of the zone. The top player in the stack will screen the middle of the zone, allowing for an easy interior catch. Buster is a set that is especially effective against a 2-3 zone. An inside ball screen collapses the defense, with a back side screen freeing up a shooter. If the defense covers the shooter, there is a simple read to get an interior catch. Side Elevator is a quick hitter for a look at a 3 or post up inside. The back screen from 2 forces x2 to help. 2 then uses the elevator screen and gets the pass from 1 for a shot. If 2 doesn’t have a shot, he looks at 5 in the post. This is the base action of the UNC Tar Heels Secondary Break. It begins with a rebound and wide outlet pass. Post makes hard RIM RUN! On ball reversal through the trailer, the wing goes over the block to back screen for trailer. If ball is not in the the air for lob, cross screen and look to enter to 5 or run your termination offense. The video shows some counters for the break and a step out three by the back screener. North Carolina uses this BLOB play to get looks at multiple scoring options. It starts with a back screen for a layup and the elevator screen for a shot. If these options aren’t available, the ball gets reversed and the Tar Heels get into a screen the screener action. France commonly uses the ball screen as the initial action in their Horns alignments, but it is the second ball screen that is the real catalyst. In Horns Get, French superstar PG Tony Park of the San Antonio Spurs, dribbles off the first ball screen and drags his man to the wing. The screener cuts away to the sideline to space as the other big comes to “get” Parker open with a ball screen on the wing. Parker then has a double gap (shaded area, Frame 3) to attack coming out of the ball screen. The screener rolls to the rim and the wing in the corner lifts to counter his man tagging the roll man. The Celtics run this set designed to expose x3 in the ball screen coverage. The ball screen for 1 after the UCLA cut forces x3 to help on the ball handler. The quick advance pass from 1 to 5 gave 3 time to slip to the basket and receive the pass from 5 for an uncontested layup. Down by 7 points with 11.2 seconds to play in Game 2 of the 2014 Eastern Conference Finals, Frank Vogel drew up the following SLOB to get good 3pt look. Horns can force less mobile defenders to guard in space, and teams can exploit this by using Horns Wide Go. Action begins with a ball screen and wide pop. 1 executes the throwback pass to the screener 4 as 5 cuts to open gap space. Forced to hedge on 1, defender x4 is late getting back, leaving 4 free to attack in double gap space. 1-Up Pop is a counter play of the basic 1-Up action. The weak side is cleared out, and the point guard is reading a back screen. The hope is that the lob will be available. If not, the back screener will out cut, and could have a shot. If the defense switches, then there is a high/low look. Banger is a zone set designed to get a lob, but also has a screen-the-screener option. It also allows the point guard to be the decision maker, which is a positive for most teams. Pistol Action refers to a dribble handoff immediately followed by a ball screen. It is commonly used flowing out of transition to get right into offense while the defense is still getting set. Common set from Gregg Popovich to get an easy basket for his big man in the post. The Spurs run this frequently out of timeouts as a counter to their Philly (Iverson cut) sets. The screen-the-screener action presents post touch or jump shot options. The season is here! It’s time to take your coaching game to the next level. Get FastDraw today and organize your #XsOs like a pro!